Nowrooz, or the Persian New Year, falls this year on March 20th at 22:45:11. This is also, of course, the time of the spring equinox, the first day of spring. The timing is crucial – it is worked out according to the solar calendar. This year will be 1394 – the years are counted from the date of Mohammed’s flight from Mecca to Medina. However, just as with Christmas, Nowrooz is quintessentially a pagan festival. It has its origins way back in the mists of time, when the generally practised religion in Iran was Zoroastrianism, and there are strong elements of superstition woven into the customs surrounding it. On the eve of the last Wednesday of the year (Chaharshanbeh-Suri), for example, Iranians the world over light fires which they then jump over, addressing the flames as they go, shedding their bad deeds/luck and taking strength from the fire, purging themselves for another year. Iranians decorate for the New Year – they prepare a special spread of items representing the regrowth and prosperity that they hope will come. There is the ‘HAFTSIN’ – the seven ‘S’s – seven items beginning with the letter S – you may choose from: SIB (apple), SIR (garlic), SAMENOU (a sweet wheat-based paste), SOMBOL (hyacinth), SUMAK (as in the spice), SENJED (the fruit of the oleander, aka Russian olive), SIRKEH (vinegar), SABZEH (sprouts), and SEKEH (coins). The ‘sabzeh” is grown from wheat or bean sprouts a couple of weeks before the actual day. They will also have live (gold)fish to represent new life and a shedful of sweeties (to bring sweetness into their lives). The NOWROOZ table will be set with painted eggs, mirrors, candles, and a copy of the Koran. It is awfully pretty. And then there is Haji Firouz, the Persian Father Christmas. He is a colourful all-singing all-dancing, gift-giving character, usually dressed in red and portrayed with black make-up. This at first seems wonderfully politically incorrect, until you realise that exotic travellers from Africa and the East were indeed seen as gift bearers and something to be celebrated. On the actual day it is important to start the New Year as you hope to go on – pink and scrubbed, in new clothes, relaxed and happy, with a clear conscience and surrounded by your very nearest and dearest. As the clock strikes you hug and congratulate everyone, and then eat some of the vast number of sweetmeats in front of you. Gifts and money are given, especially to children, money being distributed by the elders from the pages of the Koran. In Iran there is then a period of great festivity – businesses and schools close for two weeks, and the time is spent visiting friends (in ever decreasing circles of importance) and feasting. Finally, on the thirteenth day after the New Year, Iranians go out for a picnic. Yup, all of them. It is regarded as being unlucky to be indoors on the thirteenth day, which is thus known as Sizdahbedar (literally: the 13th day outdoors). Mean London park-keepers have gotten wise to this and the fact that exuberant Iranians love to barbecue stuff, and so you will often find parks locked on this day (humbug, it seems, is not limited to Christmas). The sabzeh (which should now have grown quite high) is tied by the members of the family, as each one recites their wishes for the coming year, and then tossed into moving water (the idea being that Anahita, the goddess of water, carries your wishes back to the Tree of Life). Oh, and (in case you were worried) the goldfish are released into ponds or proper aquariums. That’s it. Have a good one. Entirely coincidentally, but am very happy to find it relevant, I cooked your Sabzi Pulao recipe yesterday (for anyone reading: in Veggiestan it is described as a favourite in Iran at New Year) and we had it with a nice chunk of smoked Haddock each. I managed to *slaughter* the rice. How on earth do you keep it from burning? There’s no liquid in there after you’ve drained it. I ended up pouring some water in which gradually boiled off but it did nearly ruin my favourite saucepan – still chipping off the carbon! Happy New Year to you too! Invest in a simmer ring aka heat diffuser – that will help you to cook your rice without burning it. Looking forward to future posts– Aloha! 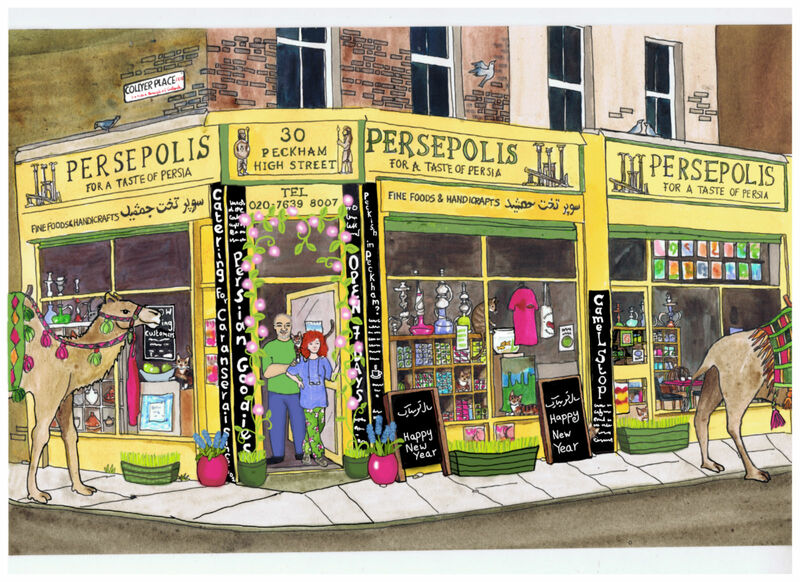 Glad you’re enjoying Persia in Peckham – and we look forward to welcoming you to our little emporium.